Do you have what it takes to be a top selling real estate agent? Click here to play! Now is your chance to find out. Enter this competitive real estate market for a chance to sell beautiful properties and win a whole lotta cash! As an agent, you'll need to find plenty of Prime Property to sell. 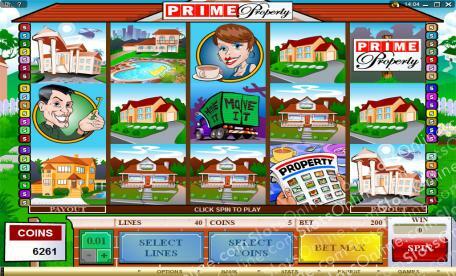 Spin the Prime Property signs as much as possible because these symbols are wild and will not only replace most others, but will also get you up to 12000 times your line bet! Keep a close eye on your competition so as to ensure you're the one bringing in all the cash. Spin three to five blonde agents to get up to 2000 times your line bet, or three to five pen wielding agents will get you up to 1500 times your line bet. Don't forget the properties! There are five different houses to spin on the reels, bringing in 250, 200, 150, 125, or 100 times your line bet, depending on which ones you spin. As you might expect, there are sure to be a few surprises while you're selling these prime properties. Don't worry though because these surprises will see you bringing in even more money. Spin three or more property listings to trigger a number of free spins, or get three or more Move It vans anywhere on the board to multiply your total bet! There are a couple of different scatter symbols in this game. The first is the Move It vans that will multiply your total bet if you can spin three or more anywhere on the board. Second, the property listings will trigger up to 40 free spins in which prizes can be multiplied by eight if you can spin three or more anywhere on the board! The Prime Property sign is a wild and will replace most other symbols, excluding scatters, to help you create more wins. It will also pay out up to 12000 times your line bet if you can spin five of them across an active pay line.